Numerical modelling will be carried out in this area to serve different purposes: First of all the evolution of the fresh-salt water distribution in the last 1000 years will be modelled. Before the land reclamation, the aquifer was mainly filled with salt water. Because of geological formations of the dune belt and human factors like land reclamation, the North Sea had no longer access to the area and the salt water was replaced by recharging fresh water. Understanding these processes will lead to an insight into how groundwater flow and fresh-salt water distribution changes due to climate. Furthermore, better insight in the current groundwater flow and fresh-salt water distribution will be obtained. The model will therefore provide a tool for integration of all available knowledge about the area (borehole descriptions, geophysical measurements such as airborne, surface and borehole methods, water quality analyses, sedimentology, etc.). Model scenarios will describe effects of future sea level change and changing water balance. Also risks related to potential floodings of the coastal plain with deterioration of groundwater quality will be modelled and give input to groundwater management. Simulation of climate change scenarios will elucidate challenges in (near) future water management in the ‘Belgische Middenkust’. In general, possible effects of climate change are changes in fresh-salt water distribution and fresh water reserves, influences on drainage patterns, seepage and salt loads in the polder and occurrence of more frequent floodings. It will be possible to asses the changes of fresh water supply in this part of the Belgian coastal plain for industrial and harbour activities. The CLIWAT study a.o. aim for a better insight in salinisation processes in the top system of this groundwater system, requiring focus on coupled variable-density groundwater, salt water intrusion and heat transport in the coastal aquifers, in combination with the impact of climate change, sea level rise, land subsidence and events like drought and floods. Derived goals are to quantify the seasonal dynamic of shallow salt-fresh groundwater system, to determine the different nutrient sources impacting the surface water system, and leading to eutrophication of the surface water, to determine the vulnerability of covering Holocene layers to uplifting and cracking, to analyze which measures are effective in mitigating the salinisation of the water system and to develop possible counter measures and assessing their socio-economic, environmental en hydrogeological feasibility. The applied tools will be 3D numerical modelling of groundwater flow processes on various scales including variable ­density groundwater flow, solute transport and heat transport and monitoring small-scale dynamic fresh-salt groundwater and surface water flow systems. Cooperation with the Belgian partners will focus on established pumping tests in the Belgian-Zeeland bordering area, and by exchanging knowledge of numerical modelling of variable density flow. In addition, the Province of Zeeland wants to incorporate this CLIWAt project into their new ‘Knowledge Network DeltaWater’, facilitating innovative developments on water issues. Modelling the impact of a changing climate will indicate whether the current land use is sustainable and how counter measures (system adaptation) eventually can reduce the unwanted effects. To identify the tangible hazard due to climate a surveying programme is projected starting already in 2008. It includes a mapping of the freshwater aquifer and saltwater intrusions by an airborne geophysical survey using electromagnetic methods, additional ground-based geophysical methods (e.g., geoelectrical methods, ground penetrating radar), drilling, monitoring in groundwater observation wells (hydraulic, physio-chemical). 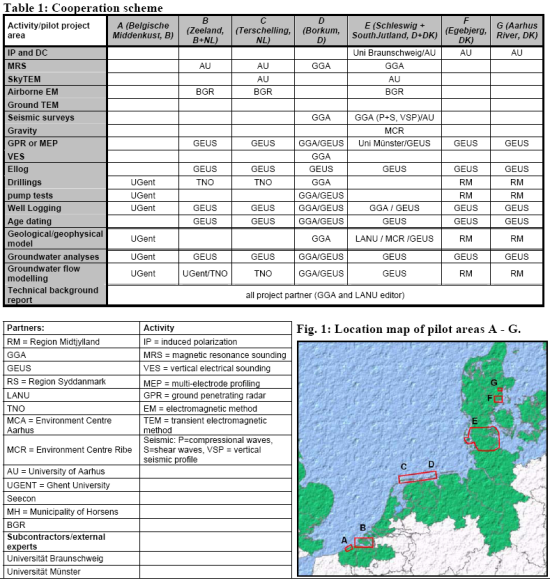 In the framework of the Cliwat-project these measurements are to be extended (e.g., MRS magnetic resonance soundings measurements at selected locations for an assessment of hydraulic conductivities of the aquifers, seismic measurements for delineation of strata, age determinations) and compared to the results of a similar survey on the North Frisian Island of Föhr. The hereby obtained information of the subsurface will be part of the data base for a 3-D geological model that integrates all available geological, hydrogeological (drillings etc) and geophysical information. This, then, is the data base for numerical simulations of flow and transport in the aquifer that results in a quantitative description of groundwater quantity and quality. As a part of the transnational cooperation within CLIWAT the Geological Survey of Denmark and Greenland (GEUS) will use these date for a groundwater flow model in which the expected changes in precipitation, sea water level and flooding are incorporated, with predictions of future groundwater levels and shapes of the freshwater lens. This enables action plans for the protection of the groundwater resources of the Island of Borkum against the expected climatic changes. Field investigations to identify the potential of natural attenuation by use of isotope fractionation. Development of a GIS-based planning tool, able for construction of scenarios for analysing the development off the city of Horsens. At the end of the project the municipality will use the result (3-D model) to make a future test model of the area and validate it with municipalities in Kolding, Sønderborg, Hedensted and Århus. The ambition is that the conclusions and experiences (new methods/-methodology) will be used and adapted in the Danish National environment legislation and EU environment legislation.